Way to go Montreal Transit Corp. Electric mobility is the way to go throughout Quebec. Côte St. Luc Councillor Dida Berku criticized the Montreal bus authority for declining to add an additional bus stop on the 262 Or (golden) shuttle, which travels from Côte St. Luc’s Mackle Road to Carrefour Angrignon in LaSalle. Seniors generally use the shuttle. Berku said residents of St. Patrick Square, in her district, started a petition to get an extra stop, near the Wal-Mart store in a power mall area across the street from Carrefour Angrignon. The shuttle also goes to Quartier Cavendish, the Côte St. Luc Shopping Centre and the commercial area of Montreal West. The STM responded last month that the authority is reflecting on the issue, and cannot add the one stop at this point. “They will advise us when they do further studies,” the councillor said. “I want to publicly denounce the STM for what I consider to be an extremely bureaucratic and very narrow approach to the problem, as we’re trying very hard to just provide good service to our seniors. Three fully electric buses are set to hit Montreal roads in early 2017. The Société de transport de Montréal is launching technical trials – without passengers – for three vehicles on the 36 Monk line. Part of Montreal’s three-year $16.7 million City Mobility program, the trials will be followed by passenger service in the spring. The Nova buses are equipped with four batteries powered by a quick-charging conduction system and boast a Quebec-designed powertrain system. Trials will assess the impacts of using quick-charging buses under real operating conditions, with regards to the transit experience for customers and drivers, planning and delivering bus service, maintenance and more. Trials will continue until the end of 2019. “Our strategic plan calls for the purchase of 100 percent electric buses for all surface transit by 2025, within the limits of available technology,” said STM chair Philippe Schnobb, adding that two quick-charging stations have been installed at Angrignon bus terminus and Square Victoria, a slow charge installation in Lasalle and a first bus delivered to STM’s Lasalle garage. 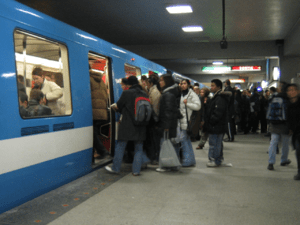 City Mobility is financed by Quebec’s Transport Ministry and the STM, as well as support from Hydro-Quebec. The Gazette Squeaky Wheels column featured a question this week about the 262 Golden Shuttle bus. A rider complained about wait times. But the STM said it is heavily used. Q: My questions is about the STM’s shuttle 262 (from Côte-St-Luc to the Angrignon shopping centre). I love to take this shuttle because it saves so much time. However, the first bus of the day cannot be relied upon — especially in winter and it’s a wait of an hour and a half before the next bus. I presume this is a low-priority route and drivers are pulled off to service other routes. I am a senior and discussion of this topic with my friends (also seniors) is we would like this route to continue, but fear low use of the service might lead to cancellation. Hope not. Also, a suggestion: If a stop was made at the Elmhurst terminal many riders from the N.D.G. area would benefit and ridership would increase. A: STM spokesperson Amélie Régis said the 262 shuttle, which stops at several seniors residences, the Cavendish Mall (and attached CLSC), the Côte-St-Luc library, the pool and the Angrignon mall is quite heavily used for a shuttle. It is actually one of the agency’s most highly used shuttles. She said there is no plan to put an end to its service. As for its reliability, she said the STM doesn’t pull buses off the route in order to service others, but all routes are subject to delays if there is a bus breakdown. MONTREAL — The city of Côte St-Luc says it will block the Montreal transit authority from creating reserved bus lanes on parts of Cavendish Blvd. and Côte St-Luc Rd. The lanes — planned for 2014 — would cause car congestion and take away parking while doing nothing to improve transit, Côte St-Luc Mayor Anthony Housefather told The Gazette. “Buses are not lagging in traffic jams in Côte St-Luc,” he said. And on one targeted stretch in neighbouring Montreal where congestion is indeed a problem, adding a bus lane will just make things worse, Housefather added. Last week, the Société de transport de Montréal said it plans to install rush-hour reserved bus lanes on Côte St-Luc Rd. and Cavendish Blvd., parts of which are under Côte St-Luc’s jurisdiction. It costs between $100,000 and $1 million to install bus lanes and priority traffic lights for buses, the STM says. The Quebec government is footing the bill for lanes put in place through 2016. STM spokesperson Amélie Régis said lanes are going on roads with a “strong potential for ridership growth.” Lanes make buses more efficient, which helps attract more passengers, she added. That’s why Housefather was surprised to hear the STM is pushing ahead. Eastbound, it would go from Sunnybrooke Ave. to Décarie Blvd. Westbound, it would run from Décarie Blvd. to Girouard Ave.; and from Alpine Ave. to Hudson Ave.
Southbound, it would go from Louis-Pasteur Rd. to Heywood Rd. ; and from Fleet Rd. to Monkland Ave. Northbound, it would run from Monkland to Fleet; and Kildare Rd. to Louis-Pasteur Rd. On the Côte St-Luc portion of Cavendish, traffic is light and bus congestion is not a problem, Housefather said. The jurisdiction of Côte St-Luc Rd. is shared. Côte St-Luc and Hampstead control much of the westbound side, while the city of Montreal controls eastbound lanes. Housefather said westbound traffic on Côte St-Luc Rd. is not heavy, even at rush hour, so buses are not slowed down by cars. Eastbound, there is little traffic between Westminster and Cavendish, he added. East of Cavendish, eastbound congestion is intense during morning rush hour, with drivers backed up for several blocks waiting to get on the Décarie Expressway, Housefather noted. Congestion there is expected to worsen early next year when Transport Quebec closes St-Jacques St. for 18 months for work on the new Turcot Interchange. Côte St-Luc has no jurisdiction over this part of Côte St-Luc Rd., but many of the city’s residents will be affected if traffic worsens, Housefather said. Three buses operate on the section of Côte St-Luc Rd. near Décarie: 17-Décarie, 66-The Boulevard and 102-Somerled. Each runs twice per hour at rush hour. The STM says heavy car traffic is one reason a bus lane is being added to this section of Côte St-Luc Rd. Hampstead Mayor Bill Steinberg said his town will review the STM’s plan and consult residents who would lose parking. He said he’s not sure his municipality could block the lane if it objected. Cote Saint-Luc resident Nathan Elberg writes this Letter: Bus lanes on Cavendish Blvd. and Côte-St-Luc Rd. will slow traffic in yesterday’s Gazette. He is correct in stating that the recent announcement by the Montreal Transit Corporation (STM) may improve the situation on some stretches of road however many more motorists will suffer traffic congestion as they make their way to and from work in their cars. Personally, I am in favour of these improvements to mass transit. Bus service, once you leave Cote Saint-Luc is far too slow. It takes too long to get to the metro stations. Van Horne is impossible during rush hour and that artery is not even part of this reserved bus lane plan. Cote Saint-Luc Road at Decarie is dreadfully slow. Moreover, reserving bus lanes on Cote Saint-Luc territory is just not needed at this time. The two stretches in question in last week’s MTC announcement are Cote Saint-Luc Road and Cavendish Blvd. Both roads already have major portions in the City of Cote Saint-Luc where no parking is allowed and therefore there is no traffic congestion. It is once you leave Cote Saint-Luc territory that traffic gets snarled. So let’s not fix a problem that doesn’t yet exist. What is really needed, and has been discussed publicly, is a rapid shuttle service from Cote Saint-Luc to the hospital sector along Cote des Neiges. Such a service would be extremely beneficial to the many hundreds of residents that go to medical appointments at hospitals, clinics, offices and labs every day as well as the hundreds of health care sector workers who live here and work there. That would get many cars off the road, reduce traffic along Van Horne, serve the needs of our older population and improve parking and congestion in Cote des Neiges. “Forbidden Montreal” is an excellent and interesting series currently running on CTV Montreal. This is a unique and fascinating look at Montreal behind the scenes. This episode is about What really happens in metro tunnels at night. Whether you use the Metro or not, if you’re paying taxes in Quebec you own a piece of the system.